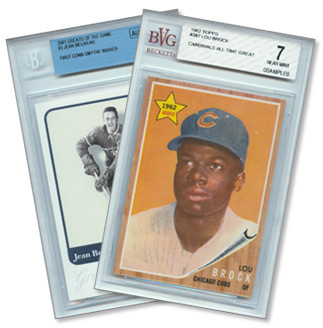 Beckett Grading Services is now offering a Personalized Label option on Grading and Authentication. For a $3 additional fee per card (minimum 10 cards, quantity discounts available for 50+ cards), in addition to standard grading fees, customers may now add a single line of text (up to 28 characters) to their grading labels. This option applies to either fully graded cards or Authentic-Only services. Some examples of personalized text may include the submitter's name/pedigree ("The James Smith Collection"), greetings ("Happy 50th Birthday, Dad! "), awards ("Dallas League Champions"), specific factory serial numbers ("Jersey #34/50", "#1/10,000"), or other descriptions. Text may not be offensive or misleading, nor suggest an artificially limited nature of the product. Beckett Grading Services reserves the right to reject any personalizations at our discretion. To request this service or for more information, please email askbgs@beckett.com or call 972-448-9188.